Juice of ½ lemon (keep the other half of the lemon and slice into quarters). In a small bowl mix together the ingredients for the dressing (everything except the onion). Once combined, add the onion and pop to one side. The onion will soften nicely in the dressing while you are preparing everything else. 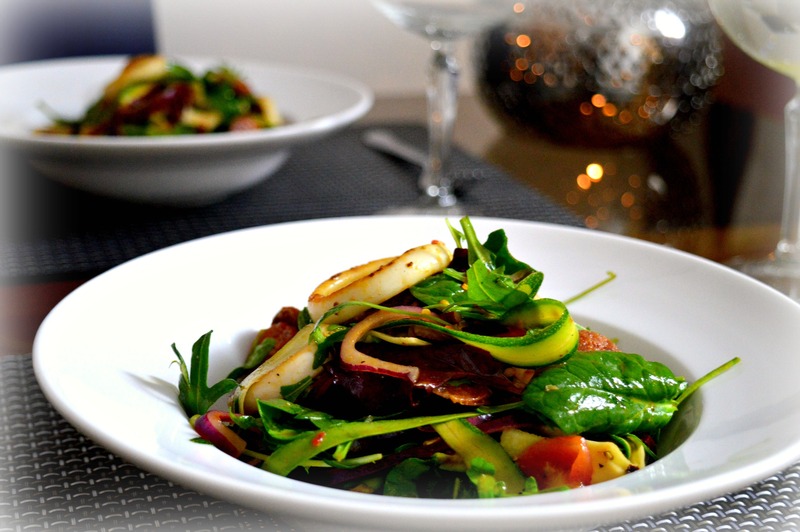 In large bowl add the salad leaves, spinach and courgette and toss together. Next heat ¼ tbsp. olive oil in a frying pan on a medium heat and then add the garlic and chillies and fry until aromatic (but not burnt, around a minute). Next turn up the heat and add the chorizo, frying for 30 seconds until it starts releasing its oils. Next add the squid, season and flash fry for 3-4 minutes until the squid is cooked (do not overcook as it will go tough). 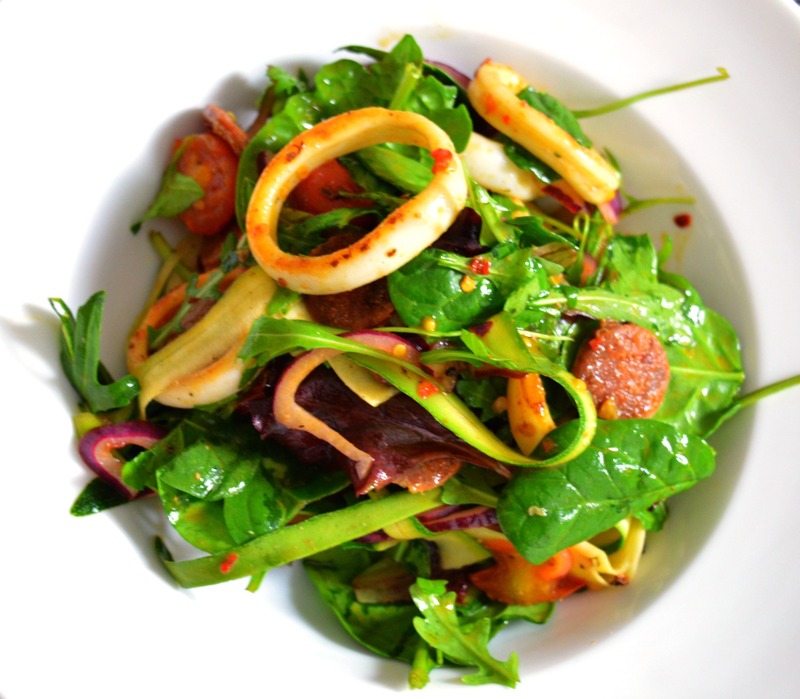 Remove the chorizo and squid from the pan and pop into the bowl with the salad. Add the tomatoes to the pan cut side down and fry for 2 minutes until they start to burst. 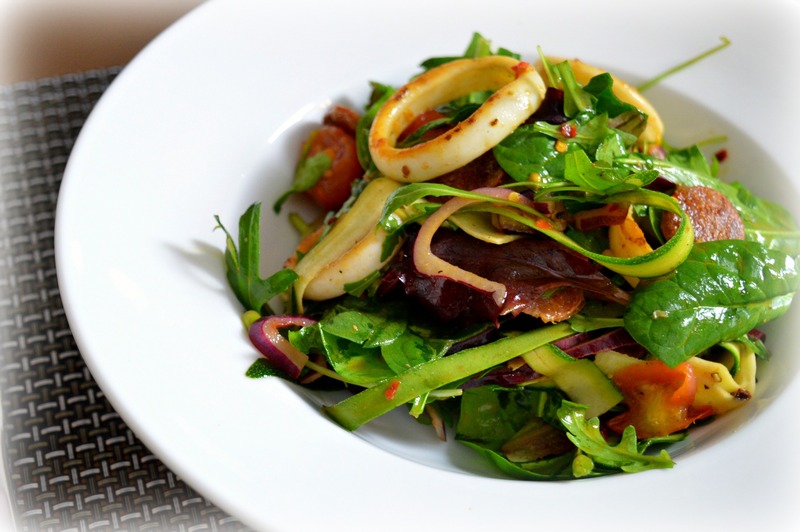 Add to the pan with the salad leaves, chorizo and squid. Finally pop the dressing/onions in the salad bowl. Toss everything together. Serve the salad in a nice big bowl and finish with a slice of lemon. I’m throwing a friends husband a birthday meal and thinking of trying this to serve six people…..never ever cooked with squid….is squid used in calamari….they LOVE calamari! On a level of 1 to 10 how easy is this to do? So outside my comfort zone but want to wow them! I’m going to look through your recipes and try and do 3 course meal using all your recipes…..any recommendations for easy but wow and prepare in advance recipes would be greatly received LOL!! !